Hope Is Not an Expectation. Hope Simply Has to Be. Hope…it cannot be imprisoned, put within borders, or shacked to a certain outcome. Hope simply has to be allowed to float on the winds that be. Merriam-Webster’s online dictionary defines hope as “…desir(ing) with expectation of obtainment”. I personally believe Merriam-Webster has it all wrong. Expectations define what we anticipate, what we EXPECT. Hope is not about fulfilling an expectation but simply being open to something good, something better, the POSSIBILITY without the fencing that is expectation. It has taken me 33 years to realize that for all the hopes I had ever had, I was actually expecting things to work out a certain way; I wasn’t simply allowing a certain possibility to live in my future life. This has lead to numerous, painful disappointments because when the outcome of my “hope” didn’t meet my expectations, I felt cheated, let down, and angry. I was never really taught what hope meant. It was never modeled for me that hope is light and pure and needs no sense of expectation. 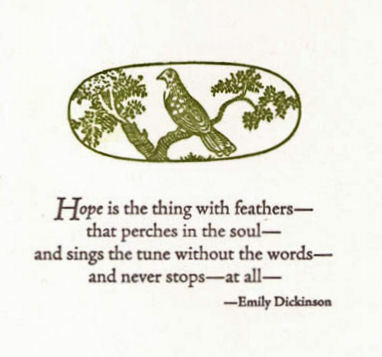 Hope simply is. I am still grappling with how real, unadulterated hope fits into my life because I always find that sneaky little devil called expectation lingering in the background, but I am thankful that I have been able to at least, come this far to realize that hope cannot live, nor do anyone any good while being fenced in by expectation. This entry was tagged Abandonment, anxiety, Bipolar, borderline personality disorder, Defeat, depression, Friendship, hope, mental health, mental illness, recovery, wellness. Bookmark the permalink.